A 4 bedroom rustic finca style country villa, sleeps 8, six in the main house and two in the self contained cottage. This country property has a large private infinity pool and is set in a rural and tranquil location in the Sierra de las Nieves Natural Park but is within easy driving distance of the cosmopolitan town of Marbella and thriving marina of Puerto Banus. Set in its own grounds of nearly two acres the property has three double bedrooms and a self contained double bedroomed cottage overlooking the large pool. There are 180 degree rural lake views from covered and open terraces and a large barbecue terrace. Peaceful and tranquil, the finca is ideal for a relaxing break close to some of the best amenities on the Costa del Sol including numerous Golf Courses, which are within easy reach. The lake is great for fishing and kayaking and we have a double and a single kayak for use to explore the length of the lake and secluded inlets. There is great walking for all levels in the surrounding countryside and horse riding is available locally. Check the testimonials to see what previous guests have thought of the villa and the surrounding valley and range of activities locally. BEACHES: The coast is only 10kms away and offers a great range of beaches to cater for all tastes. There are plenty of family friendly beaches, luxury beaches (Nikki Beach), disco beaches (Puerto Banus), and even a naturist beach at Cabopino. All offer beach bars or restaurants. A range of water sports is also available from the beaches as well as the large number of marinas and ports in the area including Puerto Banus, Marbella, Cabapino, and Estepona. ATTRACTIONS: The vibrant and throbbing marina of Puerto Banus is only 9kms from the finca and offers international shopping alongside bustling ethnic markets and an outstanding range of bars, restaurants and nightclubs. The busy town of Marbella with it's galleries, boutiques and seafront promenade is only 10kms away offering some of the best shopping and visitor facilities in Southern Spain. The cobbled streets and alleyways around it's world famous Plaza de Naranjos (Orange Square) offer ethnic goods alongside haut couture. The Square itself has a range of excellent restaurants with many more nearby. ACTIVITIES: The villa is close to Marbella & Puerto Banus, but it's rural position offers easy access to an exciting and diverse range of other activities. It is on the Sierra de las Nieves Natural Park (so beautiful it has been declared a UNESCO Biosphere) and offers easy and challenging walks as well as horse riding and guided Jeep and quad bike tours. The countryside has an incredible range of spring flowers and fauna including Golden Eagles, Ibex, and wild boars. We have private access to the reservoir which is great for swimming, kayaking and has good carp fishing and we have a double and single kayak for exploring the lake and inlets. Tennis and Padle is available only 6 kms away at the Manolo Santanna Racquets Club, which also has a fully equipped gymnasium for working out, large pool, children's play area, restaurant and expansive terraces. There is a Sea Life Centre, Amusement Park and Dolphinarium in Benalmadena, about 25kms away, which also has a cable car ride to a café and viewing point in the hills behind the town where you can take a donkey ride or watch horse riding displays. There is a great Water Park at neighbouring Torremolinos. Selwo Aventura wildlife enclosure near Estepona is 20kms away, where you can take a Jurassic Park type ride and see lions, tigers, elephants and giraffes and more, in natural settings. Less than an hours drive away is Gibraltar with it's cable car to the top of the Rock to enjoy stunning views towards Africa and the antics of the Barbary Apes. There is plenty to see and do including scuba diving and visiting the 300 year old defensive caves cut into the rock. For the adventurous who might like to visit Africa, it’s only 25 km away across the Straits of Gibraltar – an easy 30 minute trip by the catamaran ferry which leaves several times daily from Tarifa to Tangiers. Tarifa, with it's wide sandy beaches and dunes, is recognised as the kite and wind surfing centre of Europe. PLACES TO VISIT: The villa is a great base for visiting other villages, towns and cities within the area. Little can rival the spectacular drive to Ronda or crossing the bridge above it's deep gorge which housed it's ancient prison, or a visit to it's bull ring, said to be the oldest in Spain. The city of Malaga is steeped in history but enjoys many modern facilities including a busy commercial port. The other Pueblo Blancos of Mijas, Casares and Benahavis are all nearby and worth visiting. Granada with it's beautiful and historic Alhambra Palace is under two hours drive away and makes a wonderful day out. I was working in London when I was offered the opportunity of working for a firm in Spain and, after much deliberation, decided to give it a go and try to redress the work/life balance and take a sabbatical from the world of insurance. We were incredibly lucky to find this finca (rural property), built but not finished, which gave us an almost blank canvass to develop our own Spanish Dream. We had three fabulous years living there, mostly in a perpetual building site, but it never stopped us enjoying the sheer pleasure of our surroundings. We altered the layout, fitted the kitchen, finished the bathrooms, extended the original house, built the infinity pool, laid new terraces and set out the gardens and still found time to harvest our own olives and almonds. We were thrilled to be selected by BBC's Groundforce to do a complete makeover on our back garden. It was shown as their last ever episode and those memories will remain with us forever. Since returning to the UK we have kept as closely involved with Spain, Istan and the finca as possible and get no greater pleasure than hearing that our guests get as much enjoyment from their stay as we did, and still do. When we decided to buy we spent a long time finding the perfect spot. A big view preferably involving water was our biggest wish and also to be away from the coastal strip but not miles away from anywhere. We searched from Gaucin & Casares to Alhaurin, Coin & Mijas but fell in love with Istan. It's position at the end of the mountain road at the head of the Rio Verde valley means it is one of the lesser known Pueblo Blancas (White Villages) and has not been spoilt by tourism and still retains Spanish charm and traditions. The finca is only 10kms (about a 15 minute drive) from the bustling coastal area of Marbella and Puerto Banus but enjoys a seclusion, peace and tranquillity all it's own, truly the best of both worlds. Because we finished the house in the way we liked and furnished it for our own living it feels very homely and this comment has been passed by many of our guests and also that the villa has a certain ambience - but it's the location that is stunning. The house sits comfortably on the side of La Concha, the mountain behind Marbella, in the UNESCO Biosphere of the Sierra de las Nieves, facing west and surrounded by mountains and overlooking the lake and National Park, with few other houses in view. It has several living spaces and families of 8 have been able to have as much personal privacy or communal 'get togethers' as they may want, yet a single couple can get just as much pleasure without feeling they are 'rattling around'. We feel the uniqueness of our house is the ability to get as much life and activity as anyone might want in Marbella and Puerto Banus, and other towns, villages, beaches and marinas on the Costa del Sol and enjoy world class golf at the numerous nearby courses, yet return easily to the silence and tranquillity of the mountain. Whenever we are there we make sure we are always on the front terrace for when the sun dips below the hills on the far side of the lake, glass of chilled wine in hand, toasting 'end of day' and listening to relaxing music. Our choice? Enya's 'Day Without Rain'. What will yours be? toilet, shower, En-suite to master bedroom. Twin sinks. The large master bedroom has a good sized shower room with twin washbasins set in a tiled vanity unit and walk-in shower. The family bathroom has a bath with fixed shower. The separate casita (cottage) is self contained and has a large shower room with sink, WC and large walk in shower. There is Air Conditioning in all of the bedrooms as well as in the Sitting Room. Oil filled radiators for good background heat and A/C Units heat too, plus woodburner. Pool/Beach towels are also provided. Filter machine - no filter papers necessary. We have two kayaks by the lake for use. One double and one single with suitable life jackets etc. Freeform pool about 11m by 5m with infinity edge overlooking the lake. The property offers covered and open terraces for all season pleasure. The back garden was designed and installed by BBC's Groundforce team and was featured on the show's last ever broadcast. We have upgraded the pergola immediately adjoining the garden and constructed a gas BBQ and servery. A great place to enjoy partial shade and breathtaking views up the valley to the mountains of the Sierra de las Nieves. As the pool is unheated it will be 'open' from 1st May to the end of September, or by prior arrangement. It is usable at other times but may not be 100% crystal clear. Air conditioning is fitted in all bedrooms and the sitting room for cooling or heating as required. If the gentle mountain breezes aren't refreshing enough there are several fans throughout the house for additional comfort if needed. The house is warm during winter months but there is a working Andalucian fireplace and logs are provided. Oil filled radiators are also available for good background heat. Plenty of room for the 6 of us with a good size pool and well maintained garden .Villa was situated near a lovely village. We would certainly recommend this villa to our friends. Beautiful spot, amazing views, tranquil. This villa is exactly as described. Comfortable spacious accommodation, wonderful views over the lake and a magnificent pool. The instructions to the villa and local supermarket were easy to follow and communication thought out the process was excellent. We did a day in Gibraltar which was about an hours drive and ferried family to and from Malaga airport which was under an hours drive each way. The villa had everything we needed, good air conditioning in the lounge and bedrooms, well equipped kitchen, beautiful outside eating areas and a big gas bbq. We would highly recommend this villa if you’re looking for a relaxing stay in a beautiful place, we hope to return. What a fantastic week we had at this lovely villa, the villa was spotlessly clean with comfortable beds and good air con. The outside area is amazing, the pool is lovely and clean and we enjoyed just looking at the views from the edge of the infinity wall. The sun loungers are probably the most comfortable I have ever experienced and the surrounding garden was well maintained with pretty shrubs. Dave and his team who look after the villa are great and Gordon and Carolyn a pleasure to deal with. We made lots of happy memories at this lovely villa and hope to return one day. Have just returned from a fantastic week in this finca. To sum it up, excellent communication from owners prior to arriving, wonderful villa with all you need, much needed chilling by the pool with a view, and delightful evenings spent drinking rose wine looking over a view to die for as the sun set over the mountains. Add in the fun of the kayaks (warning to hefty blokes, best stick to the double kayak unless you fancy a swim), and the ability to one day watch the rich at play in Puerto Banus and the next to swim in the beauty of La Charca del Canalon in the wilds beyond Istan, and it made for a wonderful holiday. Thank you Gordon and Carolyn for a lovely week. It was amazing . Views to die for. Lots of personnel space as big family .would go back back. Villa very comfortable and clean. Pool amazing . Views spectacular . It’s a must to book . I ve already passed details on to two Freind s .
We had the most wonderful stay and we enjoyed each and every minute. The house were beautiful with a lot of space and the most stunning view. The pool was very big and perfectly taken care of during our stay. Gordon was extremely sweet to communicate with and also Tony and the poolmann David was very nice and made us feel very welcome. We really hope to return again some day soon and we recommend this house to every one looking for a quiet luxury house with a view. Whilst the villa itself is set in a secluded position on the quiet slopes of La Concha overlooking the lake of La Embalse de la Concepcion, the bustling town of Marbella with it's beaches and marinas is only a short drive away, including it's famous Orange Square (Plaza de Naranjos). The surrounding narrow cobbled streets of Marbella Old Town are a 'must see' for their stunning array of restaurants, artisan shops and designer boutiques. The beautiful and vibrant marina of Puerto Banus is even closer by and offers an exceptional range of good quality restaurants offering international and local cuisine, and numerous bars and nightclubs for partying the night away. Boat and jet ski rental, fishing and scuba diving are all available in this and other nearby marinas at Marbella, Cabopino, Estepona and La Duquesa. There are numerous nearby family friendly beaches with beach bars with sunbeds and parasols for relaxing with many offering a range of water sports for the active. At the luxury Nikki Beach you will find designer sunbeds and waiter service and beach parties every Sunday during the season. with water. Along with the Rio Verde, the spring feeds the lake which is used to supply water to Marbella and the western Costa del Sol. There are four local restaurants and three tapas bars and a range of small shops for basic provisions, including a bakers providing freshly baked artisan bread. There is also a local market on Saturdays. 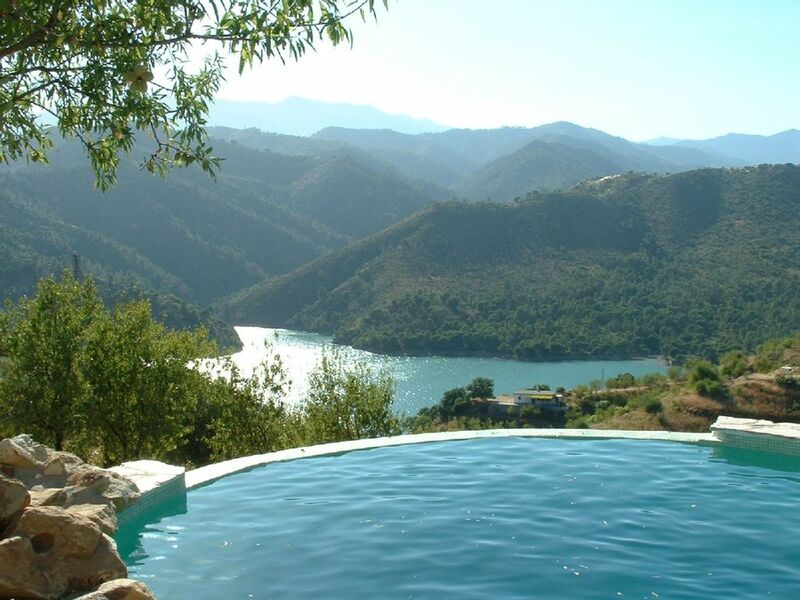 The villa enjoys access to the lake where you can swim in perfect privacy and isolation or use our kayaks to explore the length of the lake and it's secluded inlets or enjoy a peaceful day picnicking or fishing for the plentiful carp. The area is a designated Natural Park known as the Sierra de las Nieves and it is well worth doing a Jeep or quad bike safari of the surrounding countryside, which are available from Puerto Banus. Horse riding and trekking is available at nearby Aloha. The villa is central on the Costa del Sol, which is also known (deservedly!) as the Costa del Golf. There are numerous top quality Golf Courses within easy reach of the property including Finca Cortesin, Los Naranjos GC , Las Brisas GC, Aloha GC, La Dame de |Noche (floodlit), La Quinta Golf & Country Club, Marbella Golf & Country Club, Rio Real GC, Guadalmina GC, Atalaya GC, El Paraiso and Los Flamingos to name but a few!! Slightly further afield is La Cala Golf and Alhuarin Golf and the world famous Valderamma at Sotogrande is an easy drive away of about 55kms as is the excellent new La Reserva course. The new and old courses of San Roque, featuring ancient Cork Oaks, are about 60kms from the Finca, about 45 minutes drive away as is the resort and golf course of Alcadeisa. After a strenuous day on the golf course or a trip to the beach or visiting the sites there is nothing quite as relaxing as retreating to the peace and quiet of one of the villa's terraces and enjoying a glass of wine watching the sun set over the pool and lake. The surrounding area is so natural and beautiful it has been declared a UNESCO Biosphere and has an incredible range of spring flowers, and wildlife including Golden Eagles, Ibex and wild boars. The villa is about 2 hours drive from Granada with it's internationally acclaimed Alhambra Palace as well as the Sierra Nevada skiing area which enjoys good snow conditions from December to late March. It is one of the few places in the world where you can ski on piste in the morning and be water skiing from the beach in the afternoon. Rates include a weekly clean and change of bed linen & towels for all rentals of 2 weeks or more. A non-refundable holding deposit of 25% of the total rental will be needed to reserve the property. The balance plus a security deposit of £250 must be paid 6 weeks before the start of the rental period. This deposit, will be returned within 14 days, less deduction for damages if any.